The effect of gravity is heralded as proof of relativity but it is actually fairly easily explained by a number of other means. You'll find that I currently have little contention with the quality of the measurements, equipment or recording of the results of this experiment. The interpretation is another matter entirely though. Many of the inclusions of general relativity took observed effects and interpretted them a certain way. My problem is with the explanation of why. He was able to forsee this effect from observational data and I have to give credit that it seems there is one small disjointed portion of his theories that he sort of got right. I think he may have interpretted this from the formulas he got from Paul Gerber . If not plagiarized, it is a great observation and prediction. However, it proved absolutely nothing in regard to time dilation or the constancy of the speed of light. 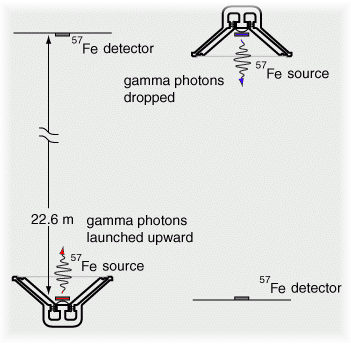 In just 22.6 meters, the fractional gravitational red shift given by is just 4.92 x 10^-15 , but the Mossbauer effect with the 14.4 keV gamma ray from iron-57 has a high enough resolution to detect that difference. In the early 60's physicists Pound, Rebka,and Snyder at the Jefferson Physical Laboratory at Harvard measured the shift to within 1% of the predicted shift. Relativists believe there is no other possible explanation, but I beg to differ. While gravitational time differences are more easily explained via Aether density. This experiment is slightly more difficult to explain but far less magical than the current interpretation. What it seems we basically have is a Doppler effect brought on by gravity. This effect can be explained in a number of ways none of which require SR. One theory is somewhat similar to quantum mechanics and the Higgs Field with each particle of Aether being analogous to a Boson. If all matter is always absorbing particles of Aether at a consistent rate, the earthward Aether flow would cause the downward wave to pass by the detector faster causing a higher frequency and the opposite for the upward one. This is part of my own theory of gravity in which there is a constant pressure of the medium and gravity is simply a localized depressurization area causing something akin to buoyancy ala Archimedes. In this case the change of speed caused by different medium densities would have to be less than the speed of Aether flow. Another explanation that might fit is that density of the medium higher up increases both the workings of the emitter and the speed of wave transmission but not in exact equivelence. In this case the emitter creates a higher fequency at the source that is not equally deminished by the slower speed of travel nearer the bottom. Additionally there is the consideration that regardless if you believe in gravitational time dilation or differing Aether densities you have to believe that all the equipment itself - emitters, receivers, etc - would be affected in numerous ways while conducting the experment. I have seen no mention of this consideration in any documentation about the experiment. If the clocks that measures the time between wavefronts and the electricity that runs through the wires that sends a signal to beat or that it received a beat are all effected, then some serious implications arise.